ROOBIT - это сервис, ориентированный на любого инвестора, будь то начинающий или продвинутый профессионал. Любой, кто стремится создать диверсифицированное портфолио без дорогих и сложных методов, будет чувствовать себя как дома с ROOBIT. Мы используем широкий спектр инвестиционных продуктов, от акций до ETF. Мы предлагаем комплексную услугу инвестирования в акции, которая может легко удовлетворить ваши конкретные потребности в хороших инвестициях. Наша программа поддерживается Forex, Bonds & Stocks Trading с различными финансовыми институтами по всему миру. 06.01.19 10:14 Transfer Sent Payment: 60.00 USD to account U18147604 from U1294xxx. Batch: 241851034. Memo: Shopping Cart Payment. Deposit to ROOBIT User allhyips. 07.01.19 18:57;Account;Receive;Received Payment 0.9 USD from account U18147604 to account U1294000. Batch: 241993644. Memo: API Payment. Withdraw to allhyips from ROOBIT. 09.01.19 05:50;Account;Receive;Received Payment 0.9 USD from account U18147604 to account U1294000. Batch: 242138544. Memo: API Payment. Withdraw to allhyips from ROOBIT. 10.01.19 18:11;Account;Receive;Received Payment 0.9 USD from account U18147604 to account U1294000. Batch: 242325402. Memo: API Payment. Withdraw to allhyips from ROOBIT. 12.01.19 06:52;Account;Receive;Received Payment 0.9 USD from account U18147604 to account U1294000. Batch: 242470554. Memo: API Payment. Withdraw to allhyips from ROOBIT. 13.01.19 18:13;Account;Receive;Received Payment 0.9 USD from account U18147604 to account U1294000. Batch: 242619720. Memo: API Payment. Withdraw to allhyips from ROOBIT. 15.01.19 07:46;Account;Receive;Received Payment 0.9 USD from account U18147604 to account U1294000. Batch: 242775191. Memo: API Payment. Withdraw to allhyips from ROOBIT. 16.01.19 16:38;Account;Receive;Received Payment 0.9 USD from account U18147604 to account U1294000. Batch: 242949985. Memo: API Payment. Withdraw to allhyips from ROOBIT. 17.01.19 22:37;Account;Receive;Received Payment 0.9 USD from account U18147604 to account U1294000. Batch: 243078564. Memo: API Payment. Withdraw to allhyips from ROOBIT. 18.01.19 17:45;Account;Receive;Received Payment 0.9 USD from account U18147604 to account U1294000. Batch: 243167348. Memo: API Payment. 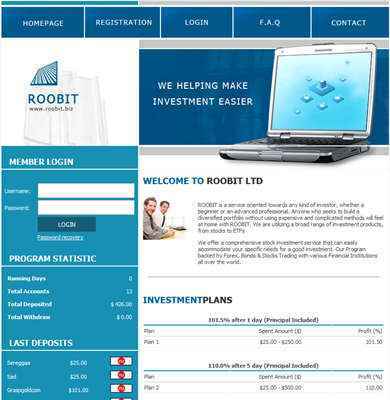 Withdraw to allhyips from ROOBIT.